UCLA is in the College World Series. Play starts this coming weekend, and they’re two years removed from a second place finish. This year’s squad, coached by John Savage, has his fingerprints all over the program. The team is is not explosive, but their motto of “grind for nine” results in a handful of runs that generally stand up with their stalwart defense and effective pitching. They open play against Stony Brook, the tiny school from Long Island, has never made it anywhere near this far. . .and thusly is the darlings of the College Baseball landscape. Oh yeah – Stony Brook features three guys from Crespi in the starting lineup. Yes, Crespi of the San Fernando Valley. Should be fun. UCLA had seven ballplayers drafted this year in the first 15 rounds – not including three recruits that went in the 1st round – so the talent is vast. . .though rather striking is their lack of power, or a power hitter. their 3-hole guy, Cody Regis, did NOT hit a homerun this year, but still knocked in 31 (in 50 games) and swatted .357. UCLA will face Stony Brook (America East champions) in its opening College World Series game on either Friday or Saturday. Game time TBD. 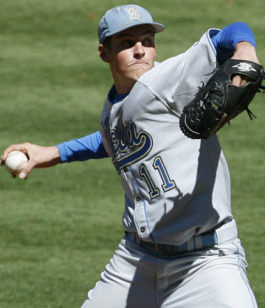 The youth-laden UCLA Baseball continues their improbable run to the National Title today, in the first game of a best-of-three series vs. the University of South Carolina. Former first-round pick (Yankees, 2008) Gerrit Cole will have the start for the Bruins. 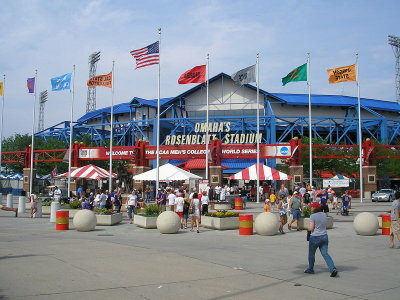 The game begins at 4:30pm PST, in what will be the last set in Omaha’s famed Rosenblatt Stadium. The Bruins are trying to follow in the footsteps of their female brethren, as the Softball team won the World Series/National Title earlier this month. 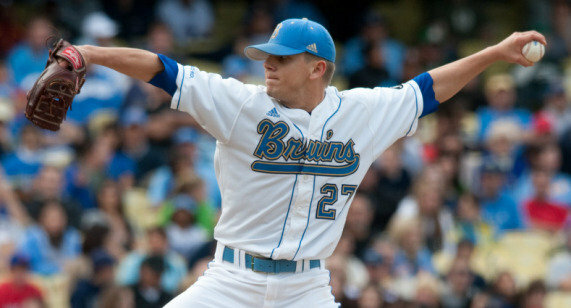 Left-hander, 2nd-round draft pick and third starter Rob Rasmussen (Pasadena Poly HS) pitched a gem for the UCLA Baseball team, leading them to their third College World Series berth in the history of the program. The win over Cal-St. Fullerton was only their fifth in the last 23 meetings between the teams, and perhaps alleviated concern that wunderCoach John Savage would not be able to get the proverbial Titan off of his back. Rasmussen’s performance was especially impressive, pitching a one-hitter for his first collegiate complete game, locking down the 8-1 victory. And now, the College World Series in Omaha’s Rosenblatt Stadium presents the opportunity for the Bruins to win on the heels of the Softball team taking the title as they take on the Florida Gators in the first game of the double-elimination tourney.